The college season is over. Well except for those meaningless bowls and many more meaningless awards. Let us now add to the fray with our own meaningless awards. By the by, Surebud would like a bowl game. We could play it at Alamo Stadium in San Antonio and we'd like to offer first sponsorship dibs to Shiner Beer, not that Holiday Special crap, the real Shiner Beer. No trophies for this one, we deal in the real collateral of college athletes: Beer. Winner gets a pasture party hosted by Shiner with performances Joe Diffie or dad-gum ZZ-Top. Loser gets a veggie tray and a stack of National Geographics. We'd take any two teams that qualified for a bowl but didn't actually make one. This year for example we'd have to take Texas State, them being local and all, and then of course UTSA. THE BATTLE OF I-35 REVISTED! With geography and local interest we might get close to filling the stadium, but even if we don't we'll profit because the Shiner Bock Surebud Bowl committee will be crooked, like Fiesta Bowl committee crooked. But I digress, on to the winners and losers of the Round-Up's End of Season Awards. Whaaaaa? No Bryce Petty? Yep. Don't get me wrong, Bryce Petty had a great year, but when we look at the stats it's clear that Johnny Football was better. Examples? Sure. Against all opponents Petty completed 61% of his passes with a 179 passer rating. Now once we get into conference, against more evenly matched opponents the completion percentage drops to 58% and the rating falls to 165. Again not bad, but not Manzielian. Against everyone Manziel completed 69% of his passes with a 170 passer rating. Against conference opponents Manziel threw for 200 less yards than Petty but completed 69% of his passes and had a passer rating of 162. Now, why do we focus on these two stats? Because completion % won't vary across splits the way that yardage will and passer rating, along with completion %, are great indicators of efficiency. Against ranked teams Manziel's passer rating was 152. Petty's was 141. Remember passer rating takes into account the interception difference which was 13 for Manziel and only 2 for Petty. 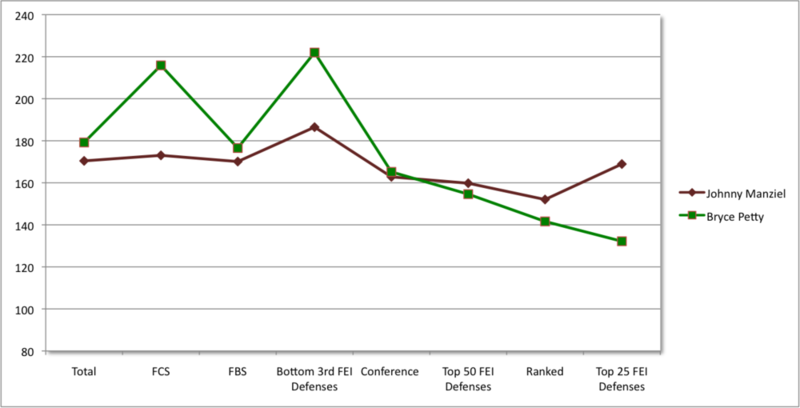 If we take Football Outsiders Fremeau Efficiency Index or FEI of the most efficient defenses in the NCAA, we get a better view of how each players played against better opponents. Limiting the FEI to the top 25 defenses, Petty played against three - Oklahoma State, TCU, and Oklahoma. His completion percentage was 54% and his passer rating averaged 132. Manziel played against 4 top 25 defenses - Alabama, Auburn, Missouri, and Ole Miss. Manziel's completion percentage was 74% and his average passer rating was 168. Against teams ranked from 75 to 125 in FEI, both players played three such schools, but Petty had exceptional numbers against these squads while Manziel's numbers were more consistent with his overall performance. Bottom line, Petty feasted against poor defenses and dropped off against better competition. Manziel played consistently against all opponents, even considering the giant dump he laid in Baton Rouge. Here's a handy dandy chart to help us all visualize the numbers. When we add in rushing yards, Manziel's 686 to Petty's 192, the gap widens. So, we feel comfortable saying that both players had great seasons, Manziel's was actually statistically better than his Heisman season and, against better opponents, Manziel played consistently better. 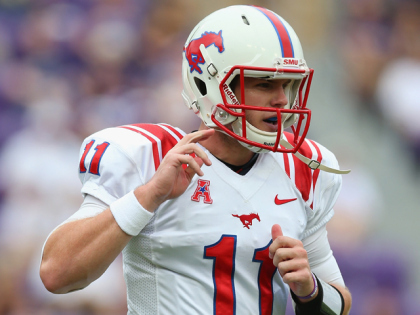 While we're here, let's recognize Garrett Gilbert, SMU's often under fire quarterback who put together a great Senior season for the Mustangs with 21 TDs, 7 ints, and a 135 passer rating. Gilbert's completion percentage rose from 53% last season to 66% this year. I think this one is a no brainer, Lackey was the best player on the best defense among FBS schools in Texas. Fast Eddie averaged 8 tackles a game. 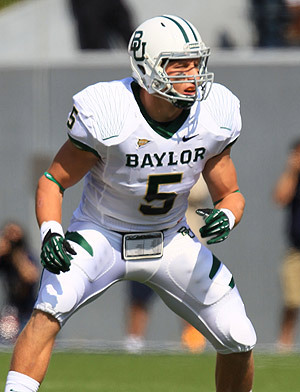 He was at his best against ranked teams when his average went up to 10 tackles per outing. Lackey accounted for 13 tackles for loss, 2 picks, 4.5 sacks and forced a fumble. Honorable mention goes to Jackson Jeffcoat, he of the NCAA leading 12 sacks and 14 hurries. We can't leave out U of H's Efrem Oliphant who had 123 tackles and 12.5 tackles for loss. Congratulations Eddie Lackey and by the way Phil Bennett, for helping the Bears get some defensive claws. We pegged U of H to be a disappointment this season especially following up last years disappointing season, but the Cougs and Levine exceeded our expectations with 8 wins. Add to that a freshman quarterback and a dynamic sophomore receiver and the future is bright on 45 south. Honorable mention goes to Larry Coker who's Roadrunners have gone from no football to FBS football in three years and have yet to experience a losing record. UTSA went 7-5 this season including a remarkable 6-2 record in conference. Next year the Roadrunners enter year one A.S. - After Soza. The way Coker is recruiting, UTSA might not miss a beat. This is awkward. 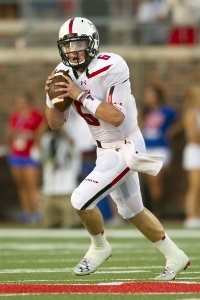 We had already mailed the award when the Bud got word that Mayfield was transferring from Tech. Could someone in Lubbock forward the stale donuts and empty red bull cans to Baker for us? Thanks. Mayfield got the nod over equally deserving John O'Korn at Houston. Happy landings Baker, we don't know why you left but I'm sure your reasons were legitimate, or not. Whatever. Another honorable mention goes to Tyler Jones of Texas State. The freshman from Stephenville completed 62% of his passes and had a 132 passer rating. As we noted above, Gilbert went from zero to hero this year, finishing second in the NCAA in passing yards per game. Gilbert finished in the top 20 in completion percentage as well. All that after three very suspect seasons. Here's hoping Garrett recovers from his knee injury and has a productive pro career. Well that'll do for this season. We'll be writing post-mortem's on all our Round-Up squads before plunging headlong into recruiting. I'm sure you'll be waiting with breathless anticipation. Posted on December 14, 2013 by Sure Bud and filed under Southwest Round-Up, Sports and tagged Johnny Football Bryce Petty Tony Levine Garrett Gilbert Eddie Lackey Baker Mayfield Texas Longhorns Texas A&M Houston Cougars Baylor Bears Texas Tech UTSA Larry Coker.